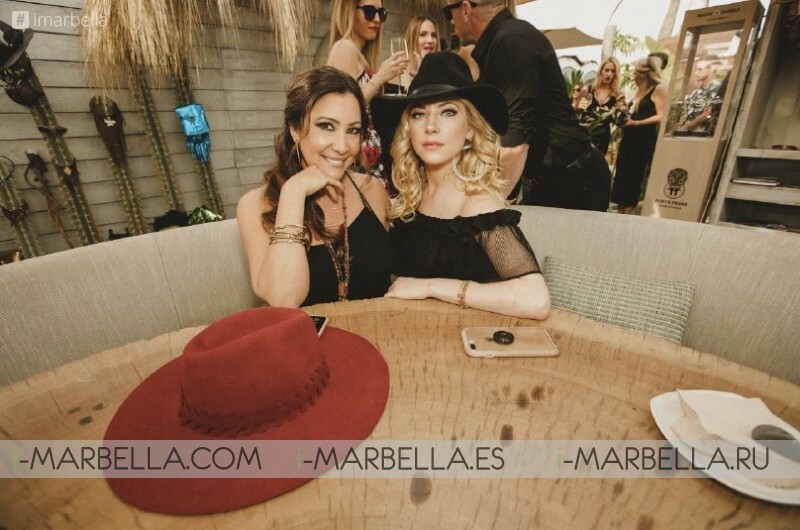 Maria Bravo and Katheryn Winnick inaugurated on Monday, 14th, 2018 the summer season of Playa Padre, the fashionable Beach Club in Marbella Spain. In which Maria Bravo is co-owner together with Nicolás Escanez, Albert Beniflah and other members of the MOSH Group. The Playa Padre Beach Club cannot definitely go unnoticed, the club was first inaugurated in 2017 by Maria Bravo and the Hollywood star Pamela Anderson. In this year, Maria Bravo was joined by her friend Katheryn Winnick, a Canadian actress who is famous for playing the warrior Lagertha in the series 'Vikings'. It’s official the summer season has started and the 'Playa Padre' Beach Club in which Maria Bravo is co-owner together with Nicolás Escanez, Albert Beniflah and other members of the MOSH Group is known for being one of the most fashionable Beach Club in town and yesterday they confirmed it with an amazing Boho themed party. Maria Bravo words were: "It is a pleasure to start the summer season of Playa Padre with Katheryn Winnick, we just came directly from Cannes where I had my most exclusive gala, the Global Gift Initiative in which Katheryn was the ambassador, She is very philanthropic and loves the fact 'Playa Padre' isn't just the fashion Beach Club but the first Marbella business that allocates part of its benefits to the protection of Casa Global Gifts childhood. " Katheryn Winnick said: ''It's so great to be here, Maria and Nico are close friends of mine and it's nice to be here celebrating, they asked me to come here for about a year ago and now I'm here for the anniversary that's nice''. ''I wanted to stay longer but unfortunately, I have to go back to LA for a couple meetings, I'm gonna try to stay longer if I can, I am looking forward to returning to Marbella.'' Maria and Katheryn arrived yesterday back to Spain from Cannes, where they celebrated and fundraised money for the Global Gift Foundation. The opening summer party was started at 6.30 pm in a very relaxed and musical atmosphere where DJ Bedouin had everyone dancing to the rhythm of his music in a very ideally atmosphere of romantic and chic Boho Black influence, which was, by the way, the dress code for the night. Playa Padre starts the summer with the aim of becoming one of the most exclusive clubs in Marbella. Playa Padre opened its doors for the first time, a year ago with a very strong philosophy using the Boho Style, a movement where arts and creativity have more importance than money, being associated with artists, writers, intellectuals or travelers. In which several Beach clubs around the area have been trying to make their own style, sharing this same fashion style look. "We are aware of the success of our way in seeing the world, that's why the idea is to grow step by step, giving our customers the best and most exclusive service, incorporating a nautical street, massage cabins, parking service and an exclusive 'events' department. This year we will also celebrate Wednesdays and Fridays Summer parties where music and many surprises will lead our customers breathless.'' said Carmen Navarrete, co-owner of Playa Padre. Playa Padre is the first Marbella business that dedicates part of its benefits to the Casa Global Gift, a multifunctional center for children with chronic or considered rare diseases, located in the municipality and sponsored by María Bravo and the actress Eva Longoria. Playa Padre is located in the 'El Cable'' beach area which has an area of about 700 square meters that are distributed between a bar area, a lounge, a dining room and a hammock area of about 400 square meters in an environment natural palm trees and wood ornamentation. At the end of May, the prestigious Beach Club is expected to celebrate its first anniversary with a party where their attendees will enjoy it to the fullest since there will be many gratifying surprises.